As roles and tasks shift in tandem with the expansion of new technologies, and the division of work between human and machine is redrawn, it is of critical importance to monitor how those changes will impact the evolution of economic gender gaps. Artificial Intelligence (AI) is a prominent driver of change within the transformations brought about by the Fourth Industrial Revolution (4IR), and can serve as key marker of the trajectory of innovation across industries.19 In partnership with the LinkedIn Economic Graph Team, the World Economic Forum aims to provide fresh evidence of the emerging contours of gender parity in the new world of work through near-term labour market information. The increasing expansion of AI is creating the demand for a range of new skills, among them neural networks, deep learning, machine learning, and “tools” such as Weka and Scikit-Learn. AI skills are among the fastest-growing specializations among professionals represented on the LinkedIn platform. To understand the prospects for gender parity among industries, we examined female representation within this new talent pool.20 We find that there is a significant gender gap among AI professionals.21 Only 22% of AI professionals globally are female, compared to 78% who are male. This accounts for a gender gap of 72% yet to close. Across the globe, some economies have been able to outperform the average. Table 6 shows the top 20 countries ranked according to the concentration of their AI talent pool.22 The three countries in which AI talent is most prominent are the United States, closely followed by India and Germany. At the same time, Germany is also among the countries with the largest AI gender gap. Others include Brazil, Mexico and Argentina. In Germany a mere 16% of the AI talent pool is female. In Argentina, the same figure rises to 17%. With 23% female AI talent, the United States demonstrates a moderate gender gap relative to its top 20 peers. The three countries with the smallest gender gaps are Italy, Singapore and South Africa, where on average 28% of the AI talent pool is female in contrast to 72% male. 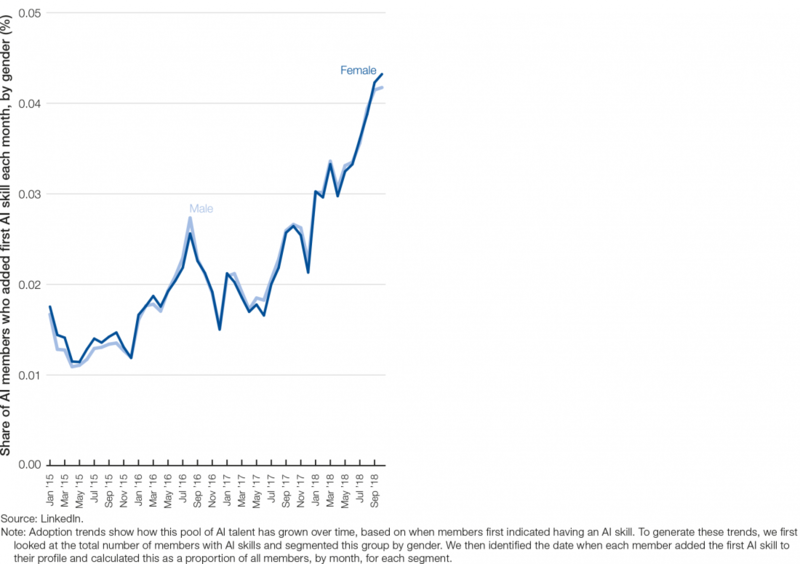 Over the past four years, the rate at which women and men have acquired AI skills has progressed in tandem.23 This trend is illustrated in Figure 8A. While skills expansion across both genders ebbs and flows in the same rhythm, the absolute number of women who indicate they have AI skills on LinkedIn is much lower. As highlighted by Figure 8B the gender gap has remained constant over the past four years even as the overall number of professionals with AI skills has risen, seeing the share of female AI talent oscillate between 21% and 23%. This four-year trend suggests a hardened talent gap that will require focused intervention. Underpinning this data is the uneven expansion of Artificial Intelligence across industries with varied gender representation. Figure 9 reveals that more than half of all professionals who possess some level of AI skills are employed across two industries Software and IT Services, and Education (inclusive of Higher Education), which account for 40% of and 19%, respectively, of the AI talent pool. Women employed in the Software and IT Services Industry make up 7.4% of the AI talent pool—or just one-quarter of the male AI talent pool. Women in the Education sector comprise 4.6% of that talent pool, or just under one-third of the male AI talent pool in this sector. The smallest AI talent gender gaps are found in the Non-Profits, Health Care and Education industries. However, the overall AI talent pool within the Non-Profits and Healthcare industries remains limited, with those industries making up 4% and 2% of the AI talent pool, respectively. 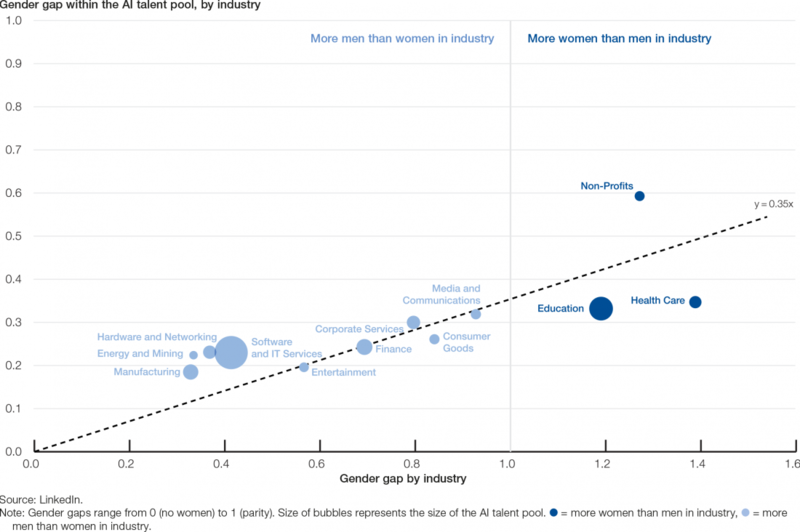 AI talent gender gaps are imperfectly correlated with the overall gender gaps in industries. As illustrated in Figure 10 the largest industry gender gaps can be found in Manufacturing, Energy and Mining, and Software and IT Services, which have closed 33%, 34% and 42% of their gender gaps, respectively. On the other end of the spectrum, in three industries the share of women is greater than men, namely Education, Non-Profits and Health Care. While industry gender gaps appear to contribute to AI talent pool gender gaps more broadly, the gaps within the AI talent pool are more significant, often as much as three times larger, and women are consistently outnumbered by their male counterparts irrespective of industry. Varying skill specializations also reflect the types of occupational roles that women and men are more likely to hold in the labour market. Figure 11A provides in-depth information about the share of men and the share of women who hold specific roles within both the male and female AI talent pools. Women with AI skills are more likely than men to be employed as data analysts, as well as in research, information management and teaching positions. For example, 4.2% of women in the female AI talent pool are employed as data analysts in contrast to 3.0% of men. Male AI professionals are better represented in roles such as software engineer, head of engineering, head of IT as well as business owner and chief executive officer—positions that are generally more lucrative and of a more senior level. Such data demonstrates a persistent structural gender gap among AI professionals, with well differentiated career trajectories taken by men and women in today’s labour market. The gender gaps evident within the AI talent pool reflect both the broader gender gaps within specializations in Science, Technology, Engineering and Mathematics (STEM) studies; gender gaps across industries; and gender gaps in the acquisition of emerging skills.25 Such figures should act as an early warning system to industries looking to achieve gender parity, revealing the depth of possible future gender gaps if current trajectories continue unchecked. Today, the growth of new fields such as Artificial Intelligence across industries seems likely to entrench and deepen gender gaps across traditionally male industries such as Manufacturing, Hardware and Networking as well as Software and IT Services. It appears, too, that AI is set to widen gender gaps across traditionally female sectors such as Non-Profits, Health Care and Education. Effective reskilling interventions and tangible job transition pathways will be key to narrowing these emerging gender gaps and can pave the way to reversing such trends. The patterns identified in this analysis reiterate a common concern: fewer women are currently engaged in the creation of Artificial Intelligence and other innovative technologies. The diversity—including gender diversity—of views among innovators is vital to ensuring the economic opportunities created by AI do not increase existing gender inequalities, and that new AI systems serve the needs of society at large. It is of critical importance to reverse these trajectories at this early stage of professional expansion for innovative sectors and ensure that Artificial Intelligence is a field that is inclusive by design. Additionally, low integration of women into the AI talent pool, even in industries and geographies where the base of IT talent has a relatively high composition of women, reduces the diversity dividend among applications of these skills and indicates a significant missed opportunity in a professional domain where there is already insufficient supply of adequately qualified labour. 19 See World Economic Forum, 2018b. 20 LinkedIn infers gender based on a member’s first name. Members for whom we cannot infer a gender value with confidence have been removed from the analysis. 21 In the analysis below, members possessing one or several AI skills are referred to as AI professionals and a professional is said to have AI skills if they have listed at least one AI skills as part of their LinkedIn profile. 23 Adoption of AI skills is determined by looking at the date each LinkedIn member added the first AI skill to their profile. Member counts are normalized for each gender on a 0-100 scale. 24 LinkedIn identified a set of 52 unique skills relevant to artificial intelligence and natural language processing tasks. The list of top skills is determined based on the most prevalent skills listed on LinkedIn member profiles. 25 See World Economic Forum, 2017c.